Every day Graystone Industries will be offering "Daily Rewards" from the graystonecreations.com web site. Each day we will create a new reward that's good for that day only. Each reward will be a substantial savings on a particular item or group of items. The reward may include a percentage discount or a set amount in savings. These discounts will only be available for 24 hours and are for online ordering only. Discounts will not apply to phone orders. 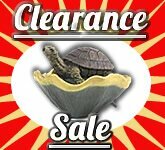 We invite you to check back daily for huge savings on a wide variety of pond and fountain supplies. CUSTOMER REWARDS PROGRAM: Congratulations!! Your visit today to Graystone Creations has earned you a surprise reward. To receive your reward, enter products of interest into the private and secure shopping cart and enter the word RewardMe. The reward changes daily at 11PM EST. Additionally, every completed purchase from Graystone Creations will receive valuable credits towards future purchases.